Since releasing his debut album “Illuminate” in the summer of 2014, Buckinghamshire-born and Brighton-based producer Alex Banks has progressed from being an in-demand remixer and Solid Steel “Mix of the Year”-winning DJ to that and so much more today. From touring Europe with Moderat to DJing in Tokyo for Red Bull Music Academy’s EMAF, via countless live performances at continental festivals including Germany’s legendary Melt, he’s raised his own bar, his own way. And what comes now and next is just as forward thinking as the material he’s put out previously, unbounded by electronic music’s typically rigid genre barriers and capable of connecting with an audience on a cerebral as well as a physical level. A key word is emotion: Alex’s music has it to spare. That was evident back when his remix of Bonobo’s “The Keeper” crept out in early 2012, slow-rising to public recognition as the outstanding reworking of material featured on Simon Green’s acclaimed Black Sands LP. With the best part of two million plays across SoundCloud and YouTube alone, attracting SoundCloud user comments like “a true masterpiece”, the track’s popularity, beside fine receptions for further remixes for the likes of Andreya Triana and Husky Rescue, formed a fine foundation from which Alex could further develop his own original material, forever retaining a grip on his audience’s hearts as he moves their bodies. The Monkeytown Records-released “Illuminate” was an immediate critical hit, acknowledged as a record that more than held its own in comparison to mainstream-brushing modern electronica from the like of Jon Hopkins, Bonobo and the musical force behind the Monkeytown label themselves, Modeselektor. “Rich and alluring,” was Uncut’s verdict, while Mixmag praised its “breathtaking ambition”. 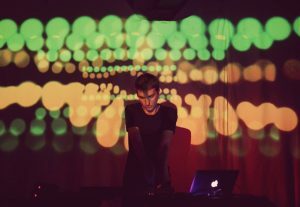 The album was an exercise in compositional contrasts, alternating between ominous and affecting vocal-led tracks featuring Gazelle Twin’s Elizabeth Bernholz, such as the glitch-kissed single “All You Could Do”, to purer dancefloor productions like the strap-yourself-in techno propulsion of “Phosphorus”. As he finds himself in a position to reflect on “Illuminate’s” strengths ahead of pressing on with album two, Alex isn’t twiddling thumbs, idly watching the hours pass until he has to get back down to his Brighton studio – which, incidentally, he’s going to completely overhaul ahead of his second long-player – to focus intensely on another full-length set. He’s reaching out to friends, to other artists he respects greatly, and is releasing a number of collaborative tracks that showcase not only his desire to try new things, but also how Alex is able to process close-proximity influences to produce new material that doesn’t discriminate against either contributing party. Listen to these fresh productions, all of which are to be made freely available, and it’s crystal clear that a compelling balance has been found between singular musical mindsets. “All artists want to feel like they’re always evolving.” Alex says of his between-album hook-ups with a cast of wonderfully varied talents. “Working with other people is a great way of learning new tricks and techniques, and taking on new influences and finding new ways to make music. It seemed like a logical thing, to just have fun, get my mates around and play with some toys.” Amongst those sharing a metaphorical play date or two with him are Alphabet’s Heaven on “All Over”, The DAWs (aka Joel Dawes of Spoils and Klax) on ‘Paraffin’, and house producer Maxxi Soundsystem on “Lost in Memory”. Also imminent is a collaborative cut with Max Cooper, available through the London-based artist’s free download series, Quotient. It’s a good time for Alex Banks, too, the one-time metal fan whose life changed with his first teenage rave – to be him, to hear him, to work beside him. Whether remixing, collaborating or operating alone, his unique mark is consistently evident in music bearing the Alex Banks brand, rapidly becoming a seal of warm approval in stark contrast to so much sterile dance fare made with machine-like precision. Just as “Illuminate” made you move inside and out, so Alex’s next chapter is sure to be full of heart-swelling builds and a very organic sense of euphoria. You can go ahead and mark it as essential, already.